It may be a cold winter in Pittsburgh, but it's Summertime Somewhere! Can't swing a trip south of the equator this February? 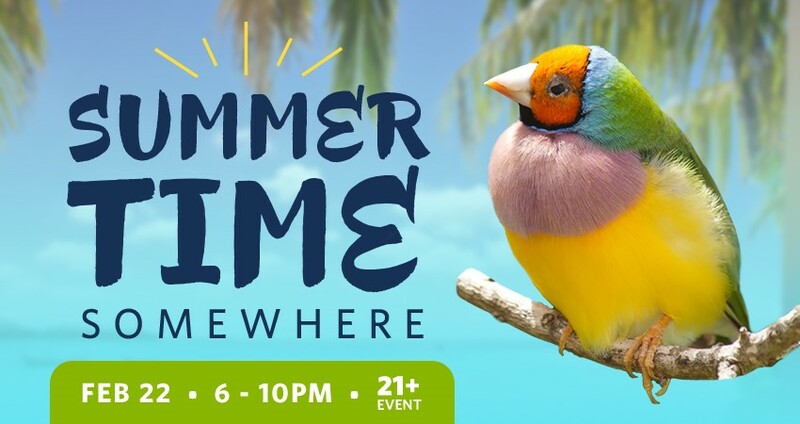 Escape to the tropical habitats of the National Aviary right here in Pittsburgh for a 21+ night of summertime fun. Channel your inner sloth and hang out in our Tropical Rainforest with Wookiee the sloth, enjoy a tropical drink alongside colorful parrots, or challenge your friends to some rousing summertime lawn games all while supporting the National Aviary’s important work in conservation, education and veterinary medicine. Enjoy live music with summertime favorites courtesy of Joel Lindsey. Sip wine, signature tropical cocktails, and tasty brews from our neighbors at Penn Brewery (available for purchase). Enjoy tasty, tropical food from Atria's (light bites included with ticket, heavy hors d'oeuvres and meal items available for purchase). Take home a trendy succulent craft courtesy of Best Feeds Garden Centers. Get crafty by creating make-and-take crafts and make treats for our birds and bats to enjoy. Watch one of our talented birds create an artistic masterpiece with a parrot painting demonstration. Explore the National Aviary's immersive habitats at night, and see if you can spot Wookiee the sloth in the trees of the Tropical Rainforest (he's nocturnal and more likely to be active in the evening). Want to get even closer to our flock? Additional opportunities are available, each for a $5 donation. Take a flight on Birdly®! This exhilarating full-body flight simulation experience allows you to fly like a bird through New York City! $5 per flight Limited tickets are available, so pre-order your flight on Showclix today! Meet Vivien the Linnaeus's Two-Toed sloth! Join our expert trainers as they provide insight into Vivien’s care, and learn about the importance of conserving sloths and other Rainforest species in the wild. $5 Limited tickets are available, so reserve your spot today! All proceeds support the National Aviary's education, avian medicine, and conservation programs both locally and internationally.